This is a teaser for the story I will tell at an event on February 12 at Kenosha Fusion. Her Uncle wanted to meet me. To size me up, she said. To see if I could handle her. Kamila and I had just married. It was the second for each of us. A month later we flew from O’Hare. To Chopin Airport, Warsaw. There, summer is as hot as here, and sweat soaked through Uncle Janek’s dress shirt, which opened at the neck. He lifted our last suitcase into the trunk of his dusty Renault, and we were on our way. 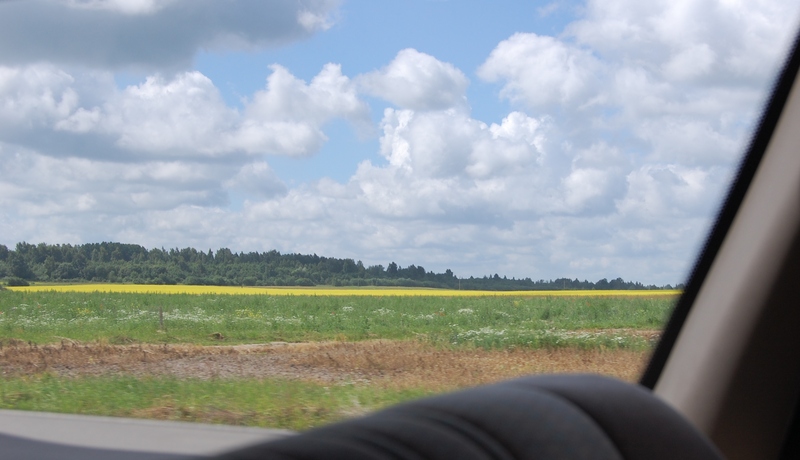 As he drove us away from the airport, Kamila explained that Mazurskie, the region of Poland where we would stay, is known for its two thousand lakes. In a few hours we pulled up to the hotel. New-looking. A red corrugated roof over rows of windows set into white stucco. After we checked in, we walked outside with Uncle Janek to the pier on a calm lake. He spoke to the young man at the row boats. Kamila told me he asked how much per hour. The man and Kamila looked at each other with familiarity. On our drive to her cousins’ farm, I sat alone in the backseat, looking at the vast fields of wheat, the forests of tall pines, and the lakes–all as I pictured them as a boy, when I read The Teutonic Knights. Now, I was in Eastern Europe, and I listened to Janek and Kamila speak the language. My second ride in Poland. Again in the back seat. But this time squished between Janek’s sons. Up-front he spoke directions to Kamila. She pulled onto the two-lane highway and headed the direction of the hotel. But, ten minutes into the ride, Janek gave another instruction. Kamila made a hairpin turn to the right, leaving the two-lane highway for a, sort-of, frontage road. We continued along a curve that carried us away from the highway and into a field. Kamila slowed the car as the pavement turned to gravel, and eventually the gravel turned to tire tracks with grass growing between. We could hear, and feel, the grass brushing the undercarriage. And outside, the tall grass grew above window level. When we could see no more, I heard Janek command Kamila to stop. She put the car in park and looked over her shoulder at me. “You’re getting out here.” I got out with Janek and the cousins. She said, “I’ll be back in an hour or so.” And the roof of the little red car disappeared into the tall grass. There I stood, in the eastern European countryside. Ready to fish. But there was no lake. All I saw was the great field of tall grass and a nearby line of tall trees. At that moment I remembered a 1971 film Straw Dogs, in which Dustin Hoffman played a mathematician who moves with his bride from the U.S. to her hometown in rural England–and I remembered the scene where a few guys from the village take the mathematician into a remote field on a snipe hunt, while his bride’s old boyfriend stays behind to meet up with her. Janek’s friendly call interrupted my memory, and I followed the in-laws through the line of tall trees. On the other side, it looked exactly the same. Another great field of tall grass. Except, here stood a large piece of construction equipment. A backhoe. Yellow, with black tires. And next to it was a small pond, perfectly rectangular and no bigger than an Olympic-sized swimming pool. Certainly not deeper. A pool of stagnant, black water created by a dig into a peat bog. There, in the land of two thousand lakes, Janek and his sons took me to fish at this tiny, made-up one.